Azerbaijan State Dance Ensemble will give a concert in Tchaikovsky Concert Hall in Moscow on October 26. A one-act ballet " Koroghlu" " will be also premiered as part of the event, Trend Life reported. Artistic director is People's Artist of Russia, famous artist and choreographer Dikala Muzakaev. "As part of a two-hour concert that can already be called a historic event in the cultural life of Russia and Azerbaijan. National dances reflecting the color of folklore, identity and rich historical and cultural heritage of the Azerbaijani people will be presented to the audience. A magnificent choreograph, performances of dancers and bright national costumes will long be remembered by the guests of the evening," said Roman Aghayev, representative of the Azerbaijani Diaspora. The concert program was first shown at the opening ceremony of the first Baku Shopping Festival, and the guests of Baku 2017 Islamic Solidarity Games. The State Dance Ensemble of Azerbaijan was founded in 1970. Throughout the years of its activities, the team demonstrates and promotes the unique choreographic traditions of Azerbaijani art, its unique folklore, the beauty and elegance of national dances. The ensemble participates in the state events of Azerbaijan, successfully tours in Russia, the CIS countries, the USA, Italy, France, Portugal, Spain, Norway, Switzerland, Belgium, Israel, India, Nepal, South Korea, China, Vietnam, Iraq, Tunisia, Algeria, Morocco, Saudi Arabia, Mexico, Brazil, Cuba and many other countries. 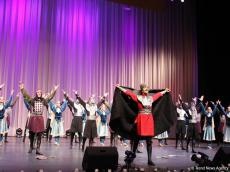 The collective traditionally represents national culture at Days of Culture of Azerbaijan in Russia, Ukraine, Georgia, Turkey, Austria, Germany, Egypt, Qatar, China, Japan, Tunisia and other countries. In 1991, ,the State Dance Ensemble was awarded the title of the Honored Collective of Azerbaijan for the outstanding contribution to the development of national culture. With the new concert program, ensemble will go on tour, presenting Azerbaijan's richest dance and musical culture.